I watched with trepidation as my Facebook feed filled with pictures of math homework, the captions reading, “Help! I can’t figure out first grade math!” and “Common Core is driving me to drink.” I read the updates with the same sort of denial I practice when I hear a funny noise in my car’s engine between pay days. Maybe if I turn up the music and ignore it, it will all go away. I’m not a math person. While I averaged As and Bs in math throughout school, I never had an affinity for numbers the way I do with words and historical details. Using the example given, I could usually work my way through the problems in my workbooks with fairly good results. I was clever enough to memorize just enough to get most of the answers correct on tests and then I’d promptly forget it all. Problem: Explain the relationship between the 2 arrays using number sentences and words. Answer: It is commutative property. “Are you sure this last one is right?” I asked, wondering which part I should Google first. “Yes,” he said with confidence. My 8-year-old proceeded to explain to me what question was being asked, what arrays are, and what commutative property is while I wondered if attending school was something that happened in an alternate childhood because I remembered nothing like that from third grade. “Okay,” I said, in awe because if even half of what he was saying was correct, he was obviously a math genius. He turned in his homework and it was returned with a big green star and the sought after “100% Good Job!” scrawled across the top. I came to a revolutionary decision. I’m no longer going to “check” his homework for anything other than completion. The way I learned math — times tables, memorization, trains speeding to Chicago from two different stations — is not how he’s being taught. Any “help” I might give will only muddy the waters of comprehension. This decision may place me squarely in the “bad parent” category among the elementary parent set, but a quick email exchange with a teacher confirmed it might also place me in the “amazing parent” category among the elementary teacher group. 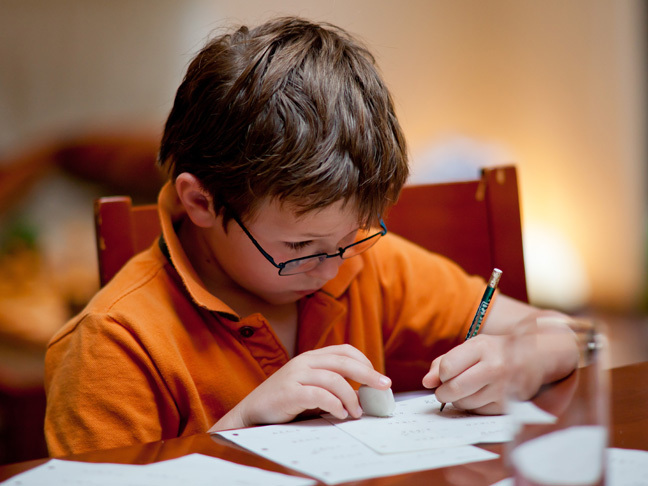 Joseph’s teacher is more than willing to spend extra time helping him out and, as she said at the beginning of the year, their homework is another way for her to gauge their progress — not their parents’. Will my decision stand in another year or two as homework becomes progressively more difficult? I’m not sure. What I am sure of is that as long as his math contains more than rapid fire times tables and flash cards, I’m going to leave the teaching of it to the professionals. And I might just have him teach me this new way of doing math. Push Presents + 5 More Things I’ve Earned As a MomWhy Do My Kids Insist on Playing with Me?